S series split case pump/horizontal split casing pump is single-stage, double suction centrifugal split case pumps, which are suitable for factories, cities, mines, power plants, agricultural, water conservancy and other fields is used for conveying water free of solid particles or physical and chemical properties similar to water and other liquids. S series split case pump/horizontal split casing pump's transmission medium temperature is 0 degrees centigrade ~ 80 degrees centigrade, the maximum allowable inlet pressure is 0.6MPa. S series split case pump/horizontal split casing pump is horizontally installed, the casing and the cover of pump are divided along the axis. The pump cover is above the shaft and the casing is under the shaft. The inlet and the outlet are under the shaft. The centerline of inlet and outlet is perpendicular to the axis. The rotor elements will be removed without disturbing the inlet piping and the outlet piping, only dismantling the pump cover while maintenance. The shaft seal uses packing seal or mechanical seal. S-type pump mainly by the pump, pump cover, shaft, impeller, seal ring, sleeve, bearing components, etc. S-type single-stage double suction centrifugal pump for pumping temperature below 80 ℃ Of water or other physical and chemical similar to the use of water. S series of single-stage double-suction centrifugal pump is mainly used in water supply plant, air conditioning water recycling, building water supply, irrigation, drainage pumping stations, power plants, industrial water supply systems, fire systems, shipbuilding industry. The pump inlet and outlet are in the pump below the axis of the axis, with the axis perpendicular to the horizontal direction. Maintenance without removing the import and export of water pipes and motors. View from the transmission direction, the clockwise rotation of the pump (according to user needs can also be changed to counter-clockwise rotation). Pump main parts are: pump, pump cover, impeller, shaft, double suction seal ring, sleeve and so on. Pump and pump cover constitute the impeller of the studio. In the inlet and outlet flanges, the installation of a vacuum gauge and pressure gauge pipe screw hole. Out of the lower part of the water flange, the system has a water pipe hole. The impeller, which has undergone a static balance check, is secured to the shaft by means of a bushing and a bushing nut on both sides. The axial position of the impeller can be adjusted by the sleeve nut. The pump shaft is supported by two single row radial ball bearings. Bearing installed in the bearing body, installed in the pump at both ends, lubricated with butter. Double suction seal ring to reduce water pump pressure chamber water leakage back to the suction chamber. Pump through the flexible coupling directly from the motor drive, if necessary, can also use internal combustion engine drive. Shaft seal for the soft packing seal (according to user needs can be mechanical seal structure). 1. Compact structure Beautiful appearance, good stability, easy to install. 2. Smooth optimization of the design of the double-suction impeller to minimize the axial force, and has excellent hydraulic performance of the leaf type, and by precision casting, the pump housing surface and impeller surface is extremely Guanghua has a significant anti-cavitation performance And high efficiency. 3. Bearings use SKF and NSK bearings to ensure smooth operation, low noise, long service life. 4. BURGMANN mechanical seal or packing seal. To ensure that 8000 hours of operation without leakage. 5. Installation form Assembly without adjustment, according to field conditions. Discrete or horizontal installation. 6. The installation of self-priming device, can achieve automatic water absorption, that is no need to install the bottom valve, no vacuum pump, no backwash, the pump can start. Pump chamber pressure: ≤ 4.0MPa. S - type single - stage double - suction level in the open centrifugal pump. The pump inlet and outlet are below the pump shaft centerline, maintenance, as long as the pump cover opened, you can remove all the parts for maintenance. As general machinery and equipment and widely used in various fields of the national economy. As the corrosion, corrosion, erosion and cavitation erosion and other damage, so that the pump casing and pump wheel surface becomes uneven, friction coefficient gradually increased, the pump efficiency decreases, power consumption increases, shorten the service life of the pump. 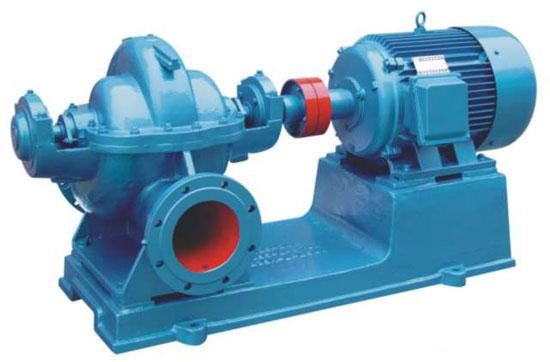 The use of the United States Ka Wah polymer composite pump coating material, improve pump impeller, pump shell surface finish, improve operating efficiency, improve water pump conditions; reduce friction loss; repair cavitation cavitation, to avoid vortex or backflow, Improve the efficiency of the pump. Looking for ideal S Centrifugal Pumps Manufacturer & supplier ? We have a wide selection at great prices to help you get creative. All the Double Suction Centrifugal Pumps are quality guaranteed. We are China Origin Factory of S Electric Large Flow Centrifugal Pump. If you have any question, please feel free to contact us. Copyright © 2019 Shaanxi Fu Long Electromechanical Manufacture Co., Ltd. All rights reserved.